Imagine you’re stuck on a hot bus for three days with limited access to technology. You’re sleep deprived, you’re not getting along with the people around you and you’re trying to create the best possible startup business idea with people who were strangers just hours ago. If this shark-tank type competition sounds thrilling to you, then you probably belong with the roughly 25 Akronite “buspreneurs” who are currently en-route to New Orleans, Louisiana. StartupBus National Directors, 2016. Photo courtesy Ian Schwarber. Here’s how it works: Once the bus takes off, various innovators, developers and designers have two minutes to pitch their idea. After this, the buspreneurs start gravitating towards the best ideas, offering their skillsets. Teams begin to form, and what follows is three days of mayhem as 4-5 teams attempt to develop a startup business that can compete in the 2017 StartupBus competition on Thursday, August 3 and Friday, August 4. On the way to New Orleans, the bus will stop at various makerspaces and incubators to help the teams develop their businesses. The Akron Makerbus will also be merging with the San Francisco team on their way to New Orleans, which will give both teams additional support. Winners of the competition receive access to investors and renewable loans and greater launchability, says Ian Schwarber, who is the strategic partnerships manager for StartupBus North America. Ian is also co-piloting this year’s Akron Makerbus, and he says that although winning is nice, it’s not the goal. Through the help of StartupBus, previous buspreneur Ray Lewis helped create Wastebits, an Akron based waste management Software Company. 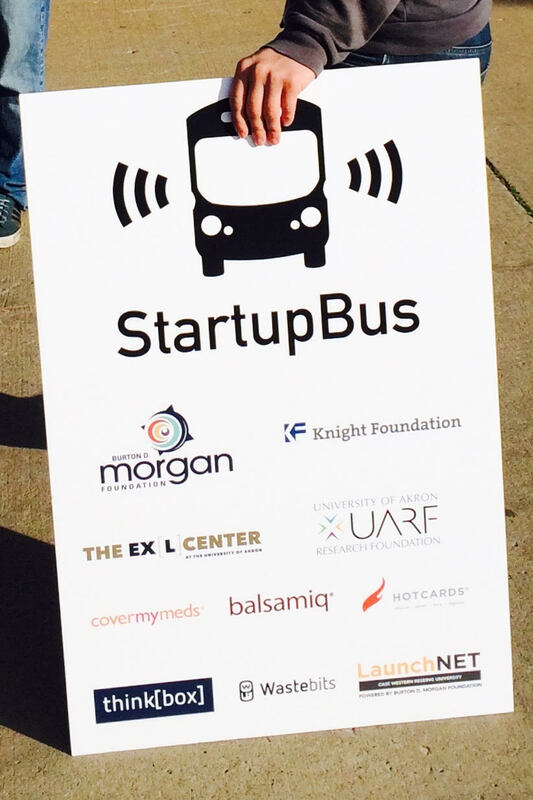 Ray says that StartupBus is typically referred to as the Navy Seals boot camp of the tech industry. 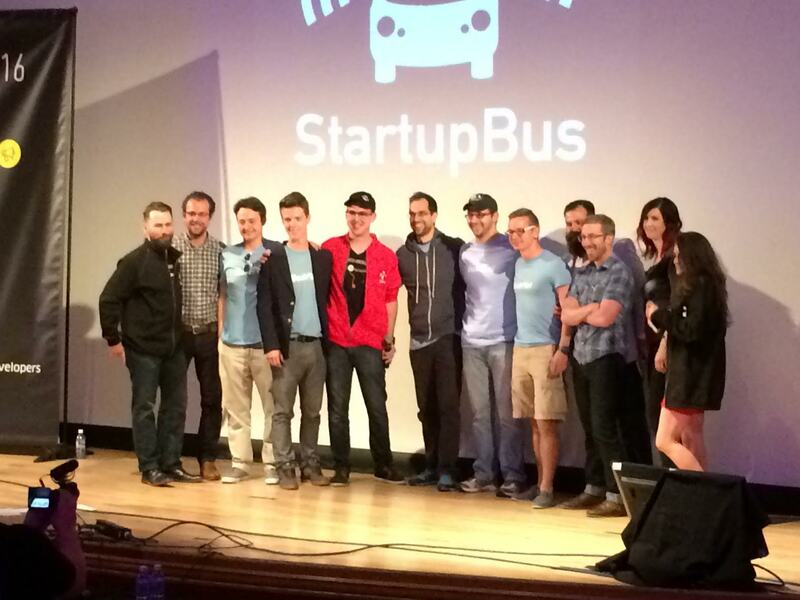 Akron Dash Pilot team, took 2nd place overall in Boulder, CO for StartupBus 2016. Photo courtesy Ian Schwarber. Aside from Akron, six cities are competing this year, among them New Orleans, St. Louis and San Francisco. Akron is the smallest city to fuel a bus. Despite this, during last year’s competition, Akron’s DashPilot team took second place, proving that there is no shortage of skill and grit emerging from Akron. Each participant will be challenged mentally and emotionally during the three days on the bus and the subsequent two-day competition that will occur this Thursday and Friday. Kyle McGee, who will be co-piloting alongside Ian participated in the competition last year. Still, Kyle says that the beauty of the bus is that there is no way to easily escape, making it a perfect place to work through the initial challenges of starting a business. All Akron Makerbus sponsors 2016. Photo courtesy Ian Schwarber. “Hitting that point is part of the process of getting through it, but there was definitely a point where I was like ‘oh man, why am I here?’” says Kyle. Throughout this week, you can keep up with our Akron team through The Devil Strip. We’ll be posting periodic updates on our Facebook page, which Ian will be sending to us from the bus. This year’s Akron Makerbus isn’t possible without a $15,000 grant from The Burton D. Morgan Foundation. To support the 2018 Akron Makerbus, Ian encourages donators to contact him at 330-388-7985 or email him at ianpschwarber@gmail.com. “Because these people are Akronites, they’re going to start businesses here in Akron and further the culture in the city of Akron,” says Ian. 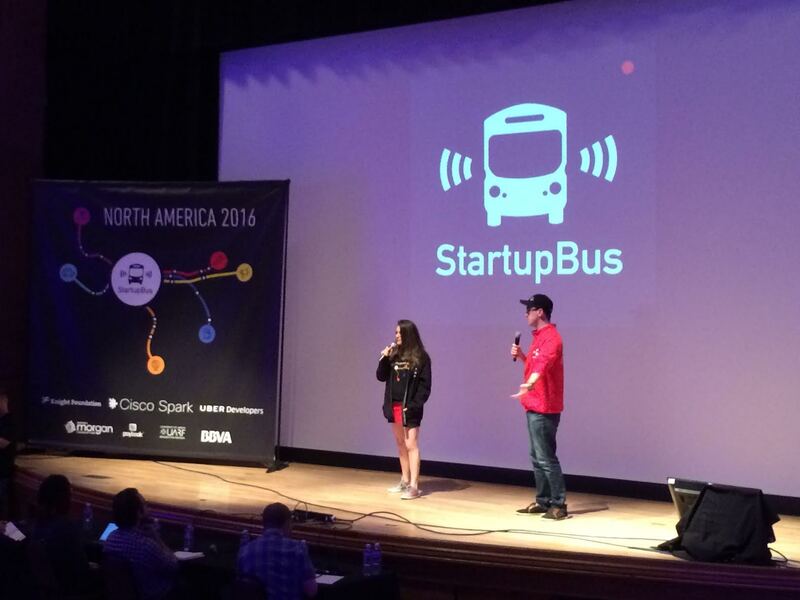 To apply for next year’s competition, visit startupbus.com. Competitors are not allowed to go on the bus with a fully formed business plan; they can only bring an idea. Aside from this, Ian jokes that the number one rule of being on the bus is don’t do a number two. If Noor Hindi participated in StartupBus, she’d probably spend most of her time writing poems and quoting Sylvia Plath.